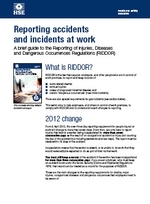 HSE RIDDOR (Reporting of Injuries, Diseases and Dangerous Occurrences) has changed its reporting process. The point of reporting injuries has now increased from over three days, to over seven days’ incapacitation, (excluding the day on which the accident occurred). Incapacitation signifies that the employee is absent, or unable to carry out the work that they would ordinarily be expected to do.